There are people, who think that meditation is a waste of time. They do not see any benefit in just sitting down and doing nothing. Are they right about that? Meditation is not a waste of time. On the contrary, it is time well spent. Outwardly, you might seem to do nothing, but you are actually doing a very useful inner work. Meditation relaxes your mind and your body and releases tension and stress. This saves you a lot of wasted energy and can improve your health. Meditation makes you a calm person, more tolerant and more considerate. It helps you focus on the present moment, instead of dwelling on the past and worrying about the future. Meditation enables the person practicing it to resist distractions, control reckless actions, and urges to think before acting. Did you know that practicing meditation helps falling asleep easily and having a better sleep? It is very simple, less stress and less restless thinking make it easier to fall asleep and sleep more soundly. It is not a waste of time, if it helps you to stop taking things personally, stop being affected adversely by what people think and say about you, and if it enables you to let go of worries, fears and unnecessary thinking. When the mind is calm, it becomes easier to focus it on work, on studies, and on whatever you are doing. Meditation gives a sense of well-being, confidence and courage. The sense of calmness, freedom, confidence and inner strength that you gain would help you to deal better with everything you encounter in your daily life. With a calm mind, you are more prepared to handle efficiently every problem and every obstacle. As you progress and continue to practice, you will notice that your calm state of mind affects the people around you, who become at least temporarily, calmer, and treat your more kindly. Do you still think that meditation is a waste of time? You might say that you do not have the time, and that you are always busy. These are only excuses, because with a little effort and with a little planning, you can always find the time. Even 10 minutes a day are fine. Later, when you notice the results, you will want to practice meditation for more than 10 minutes. You might also say that you are a practical person, and meditation is for impractical and passive people, who have no goals and do not want to accomplish anything. This is far from the truth. The most practical and down to earth people can gain a lot from meditation, giving them the ability to function better in a stressful environment, focus better on their goals, and stay calm, confident and fearless when facing difficulties or obstacles. Even if you are the most practical person, who cares only about material matters, and does not care about self-improvement and spirituality, I recommend that you try meditation for at least few weeks. If you try it for a few weeks, you would most probably want to continue practicing it, because you will see how beneficial it is. Any time of the day is suitable to meditate, but I have discovered that early morning, right after getting up is a good time, because the mental mood of this time affects the whole day. You will discover that the calmness, relaxation and inner strength you experience during meditation continue, even afterwards, many hours into the day. As you continue with this practice, and lengthen the time that you spend meditating, this affect would grow stronger. Many researches have been made on the effects of meditation, which you can easily find, if you search for them on the Internet. It was found that it has a beneficial effect in many areas, on the brain, the body, on stress, blood pressure, thinking and behavior. 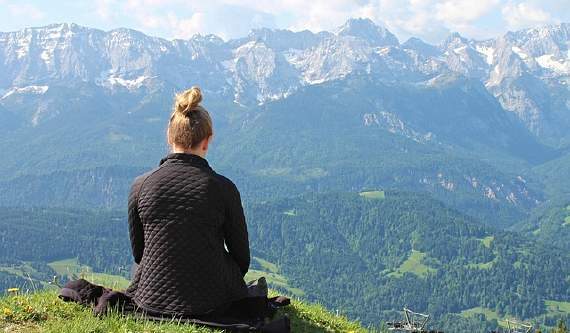 Meditation is not only for people who live ashrams and retreats. It is suitable and beneficial for businesspersons, athletes, politicians and actors. It is suitable for teachers and drivers, people working in an office, outdoors and in factories. I don’t say that meditation is suitable for everyone. If you are deeply depressed, very restless, or living in a very stressful situation, it might not be the right solution, because you might find it difficult to focus. In this situation, you need different means to deal with your problems, and only after alleviating them to a certain degree, it would be easier to meditate. Sport is very good for your health. However if you are unhealthy, sport might be detrimental. You need first to improve your health. It is the same with meditation. You need to be in a reasonable mental health to benefit from it the most. The best scenario is to practice it when your health is okay. This will train you and improve your resistance to distractions and stress, make you stronger, calmer, and able to handle better every situation in your life, just as training regularly at the gym improves your health, your strength and your endurance. I hope I was able to convince you, at least a little, that meditation is not a waste of time. You may find more information, guidance and practical advice on this topic in my book, Calm Down the Constant Chatter of Your Mind.